My daughter, CC, had a basketball game today. 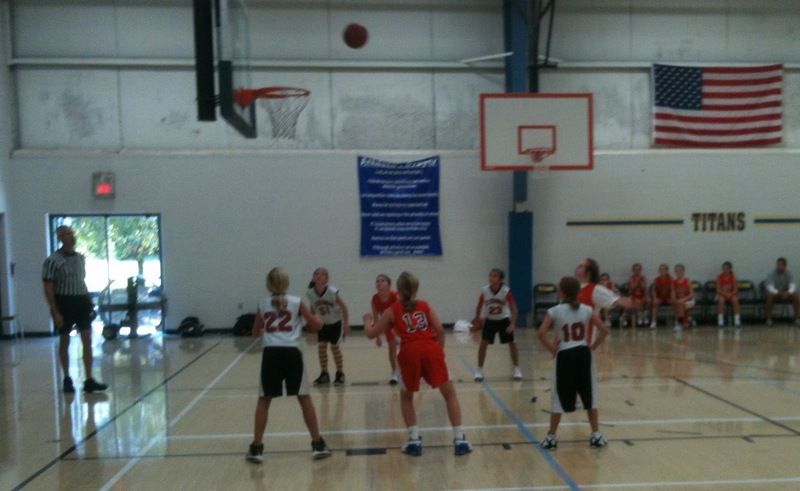 The championship game of a CYO tournament for 4th grade girls. We got to the gym early hoping to warm up, but the 5th grade girls semi-final game was in progress. I looked up at the scoreboard to see how much time was remaining. Ugh, I thought to myself. The game was only in the 2nd quarter. A bright orange team from a parish about 10 miles away was playing the 5th grade team from my daughter's school. The orange team was winning decisively. As the game progressed, the black team from my daughter's school chipped away at the lead and made a game of it. Still the coach of the orange team did not make any adjustments to the line-up late in the game. He trusted his talented guards to control the final few minutes and protect the lead. He trusted the girl in orange with think glasses to get into the right position. He turned toward the scoring table and yelled, "Foul on white #10" It was a bad call for a good reason. Although it was not a shooting foul, he put the girl in orange on the line to shoot free throws. The tall skinny ref with grey hair walked over to her and bent down. He said something to her. He handed her the ball and walked her to the line. The girl knew what to do and did not hesitate at all. The ball flew through the air on a beautiful arc with the school's Prayer for Athletes blue banner hanging in the background. My daughter's team took the court. My daughter's team played in the finals of a CYO tournament against the other team from her school. 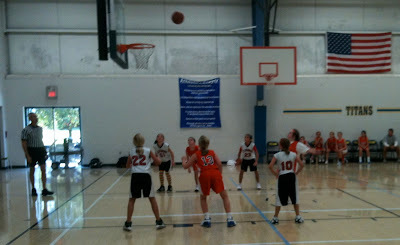 CC's team dominated the game and outshot the other team 34 to 12, but the ball would not fall in the hoop for her team. The game turned out to be a defensive low scoring game. The lead changed back and forth all game. With 7 seconds on the clock, a play was called to free up CC for a final winning shot. Her best friend got her the ball and CC did a nice cross over dribble move to the left. A pick worked perfectly to free CC up for a shot. She pulled up for a 10 foot jumper. The ball went on a beautiful arc toward the hoop. The blue Athletes Prayer banner hung in the background. Let competition make me strong, but never hostile. The ball hit the back of the rim and bounced up. If I know victory allow me to be happy. The ball hit the front of the rim and bounced up. If I am denied keep me from envy. The ball fell to the side and CC's team lost. The second line of the Prayer for Athletes says, Help me learn something that matters once the game is over. I did thanks to a ref who made a bad call for a good reason. The prayer concludes with If through athletics I set an example, let it be a good one, Amen. Ref, sir, you set a good example. The ref, along with the parents and coach of the girl with the dark glasses, are my new heros. I am sure that your daughter was disappointed but I get that she has been taught to keep things in perspective. Thanks, Stats Dad for two good and well written, stories!!!!!! !